WASHINGTON (AP) — The Pentagon acknowledged Thursday that budget shortfalls have eroded military capabilities, including training and flight hours, but stopped short of blaming those cutbacks for the crash of a U.S. Navy fighter jet that killed both crew members. Dana White, Pentagon spokeswoman, said the cause of the F/A-18 Super Hornet crash Wednesday off the coast of Key West, Florida, is still under investigation. But she was asked if there was a link between the crash and persistent military complaints about reductions in flying hours and other training cutbacks because Congress hasn’t approved the 2018 budget. 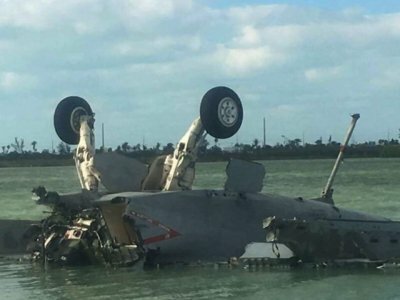 The Super Hornet was on approach to land at the naval air station in Key West around 4:30 p.m. when it crashed into shallow water about a mile (1.5 kilometers) east of the runway. Both the pilot and weapons-system officer ejected and were pulled out of the water. U.S. Naval Air Forces said late Wednesday that both had died. The aviators have been identified as Lt. Cmdr. James Brice Johnson and Lt. Caleb Nathaniel King, both Florida residents, Naval Air Forces said. Johnson, a Naval aviator and 2007 graduate of the U.S. Air Force Academy, was piloting the jet when the incident occurred while King, a 2012 U.S. Naval Academy graduate, was serving as the Weapons Systems Operator. April Phillips, a spokeswoman for the Naval Safety Center in Norfolk, Virginia, said there have been 25 serious mishaps involving F/A-18 Super Hornets since fiscal year 2008. They resulted in four deaths - including the two Wednesday - and the loss of 11 aircraft. The other two fatalities were in 2011. All 25 were considered “Class A,” which means a crew member died or the plane suffered at least $2 million in damage. There were five incidents last year, the most of any year in the past decade, and all remain under investigation. There was one mishap in 2016. Navy Cdr. Dave Hecht, spokesman for Naval Air Force Atlantic, said the squadron took the day off from training Thursday in order to grieve. Other squadrons in Carrier Air Wing Eight were briefed on the mishap and then resumed normal training operations. Barbie Wilson, who lives near Naval Air Station Key West, said she saw the crash from her pickup while running an errand. Wilson said her husband later told her he had heard two loud booms from their house nearby. She said the plane landed upside down in water that’s barely deep enough for a kayak. Justin Duane Hults, who also lives near the base, said the roar of the jet’s engines sounded abnormal right before the crash. He said he later saw rescuers pull the crew from the water. Hecht said the Super Hornet remains in the water where it crashed and will stay there until the investigation is complete. That investigation will include a review of aircraft maintenance, number of hours flown on the aircraft, physical condition of the aircrew and their activities previous to the accident. President Donald Trump has tweeted his condolences, and Republican U.S. Rep. Carlos Curbelo of Miami emailed his condolences to the victims’ families. Associated Press writer Ben Finley contributed to this report from Norfolk, Va.